Builder's Engineer: METHODS OF CONSTRUCTION: DRILLED PIER FOUNDATIONS. 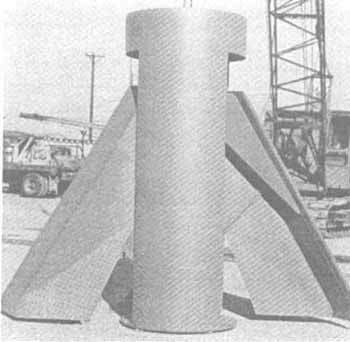 METHODS OF CONSTRUCTION: DRILLED PIER FOUNDATIONS. 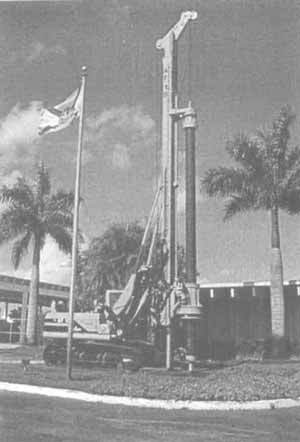 The use of drilled piers for foundations started in the United States during the early part of the twentieth century. The two most common procedures were the Chicago and Gow methods shown in Fig. 17.2. In the Chicago method a circular pit was excavated to a convenient depth and a cylindrical shell of vertical boards or staves was placed by making use of an inside compression ring. Excavation then continued to the next board length and a second tier of staves was set and the procedure continued. The tiers could be set at a constant diameter or stepped in about 50 mm. The Gow method, which used a series of telescopic metal shells, is about the same as the current method of using casing except for the telescoping sections reducing the diameter on successive tiers. There has been a phenomenal growth in the manufacture and use of heavy duty drilling equipment in the United States since the end of World War II. The greatest impetus to this development occurred in two states, Texas and California (Woodward et al., 1972). Improvements in the machines were made responding to the needs of contractors. Commercially produced drilling rigs of sufficient size and capacity to drill pier holes come in a wide variety of mountings and driving arrangements. Mountings are usually truck crane, tractor or skid. Fig. 17.3 shows a tractor mounted rig. Drilling machine ratings as presented in manufacturer's catalogs and technical data sheets are usually expressed as maximum hole diameter, maximum depth, and maximum torque at some particular rpm. Many drilled pier shafts through soil or soft rock are drilled with the open-helix auger. The tool may be equipped with a knife blade cutting edge for use in most homogeneous soil or with hard-surfaced teeth for cutting stiff or hard soils, stony soils, or soft to moderately hard rock. These augers are available in diameters up to 3 m or more. Fig. 17.4 shows commercially available models. Underreaming tools (or buckets) are available in a variety of designs. 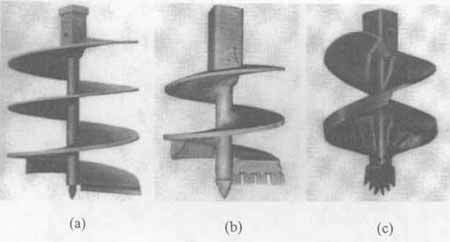 Figure 17.5 shows a typical 30° underreamer with blade cutter for soils that can be cut readily. Most such underreaming tools are limited in size to a diameter three times the diameter of the shaft. When rock becomes too hard to be removed with auger-type tools, it is often necessary to resort to the use of a core barrel. This tool is a simple cylindrical barrel, set with tungsten carbide teeth at the bottom edge. For hard rock which cannot be cut readily with the core barrel set with hard metal teeth, a calyx or shot barrel can be used to cut a core of rock. The rotary drilling method is the most common method of pier construction in the United States.